The most important inner-German checkpoint, the Autobahn crossing at Helmstedt was named Alpha by the Western Allies. 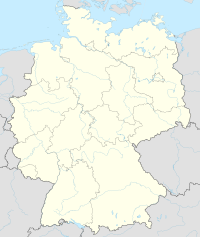 Its counterpart in the Berlin southern borough of Dreilinden was named Bravo. The connection between these checkpoints gained its importance from being the shortest connection between the western zones and Berlin, at 170 km (110 miles). During the Berlin Blockade, which endured from June 1948 to May 1949, the Soviet checkpoint was closed. Between 1972 and 1974, the GDR erected a new control portal on a 35-hectare (86-acre) field situated on a hill near Marienborn, about 1.5 km (1,600 yards) east of the border. The control portal was staffed with as many as 1,000 passport control, customs and border police employees. The buildings were linked with an underground tunnel system through which military or police units could reach the control portal quickly and secretly. The Western Allies kept control of their checkpoint on the western side, with small garrisons of French, British and American troops stationed in Helmstedt. The West German Bundesgrenzschutz had assumed control of the operative controls on the western side of the border crossing, where the buildings were notably smaller compared with Marienborn. The restrictive East German controls and the ever-increasing amount of traffic soon resulted in notable waiting times on the West German side. Therefore, the West German government added extensive car parks and rest areas on the autobahn approach to Helmstedt. Border controls were relaxed after the Wende during late 1989. The crossing was dismantled at midnight on June 30, 1990, exactly 45 years after its first opening. The former GDR buildings have been a listed building since October 1990, however the former GDR departures area has been demolished when the A 2 road was expanded to six lanes. A rest stop with a motel has now been built on part of the old GDR control portal's area. The Helmstedt-Marienborn checkpoint was one of three checkpoints used by the Western Allies. Its western side (in the former British zone) was labeled Checkpoint Alpha after the first letter of the NATO phonetic alphabet. The Allied side of the checkpoint for entry into West Berlin was named Checkpoint Bravo, and Checkpoint Charlie was the Allied checkpoint for entry into (and exit from) East Berlin. The nomenclature of "checkpoint", as opposed to the East German "Grenzübergangsstelle" (which literally means "border-crossing-place") was a result of the Western Allies not recognising the legitimacy of East Germany as a state. That changed in 1973, when the GDR was admitted to the United Nations, but the term remained in use. On the grounds of the former East German border control buildings, the "Gedenkstätte Deutsche Teilung Marienborn" was opened on August 13, 1996. The memorial is operated by the state of Saxony-Anhalt and features exhibitions and guided tours. The memorial site is accessible via the nearby rest stop's exit and can only be explored on foot. The West German buildings near Helmstedt have either been demolished or are now used for other purposes. This page was last edited on 2 March 2018, at 14:42 (UTC).